Economic Freedom Fighters leader Julius Malema said that he did not have a relationship with South African President Cyril Ramaphosa and has heard things confirming Cope leader Mosiuoa 'Terror' Lekota's spy claims against Ramaphosa who made incriminating claims against his fellow freedom fighters in 1974. Said Malema, "We are colleagues who, from time to time, will meet to exchange the notes particularly on issues of national importance. If I had a relationship with Cyril I will not contest him. I'm contesting him now I don't think he is fit to be president. By the way the things that Terror (Cope leader Mosioua Lekota) said about him I have heard them before. Why would I have a relationship with such a character. I heard so many devastating and scary stories about him. That's why I never agree that such a person should be left uncontested. I have never been to his house. We have always met in public places and in state-owned buildings." Last month, Lekota labelled Ramaphosa an apartheid spy. Lekota, a former chairperson of the ANC, said during the debate on Wednesday that Ramaphosa had sold them out in 1974. "When it was difficult, you (Ramaphosa) wrote to the special branch that we put communist ideas in your head, in doing so you condemned us to the special branch," Lekota said in Parliament. "I say this because the special branch rewarded you and they sent you home and we headed to Robben Island," Lekota alleged. 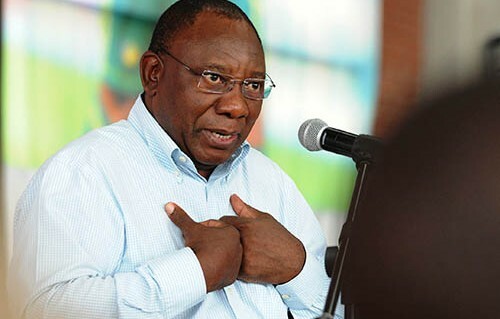 Ramaphosa, who was also arrested at the same time as Lekota for his student activism, responded by denying the allegations and admitted there was pressure from the police for him to turn against his fellow comrades, but he did buckle under pressure.